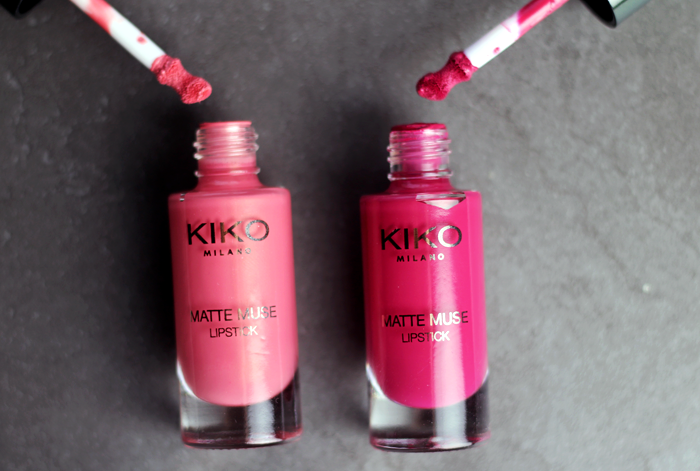 A surprise parcel from Kiko arrived a few weeks ago and as I wasn't too familiar with the range, I was keen to see why Kiko has become a much-loved beauty brand over recent months. I was immediately intrigued by the Matte Muse Liquid Lipsticks. Packaged in a nail polish-esque bottle, the applicator has an interesting shape and on first impressions, the colours looked really beautiful. They have a creamy texture making them very easy to apply. Although they do dry down after a few minutes, they remain quite velvety and don't feel at all uncomfortable to wear. My lips are always a little on the dry side and I often find matte lip products difficult to work with, but I think both the texture and the finish of these is really nice. Plushy Rose is a wearable light peach pink. It's my favourite of the two, although that's not going to be much of a surprise as you know I love this kind of shade. It's light enough to be a colour I would wear everyday and there's enough pink in there so it doesn't look too pale. The colour applies smoothly and it wears off evenly throughout the day so I don't have to worry about having splotches of colour everywhere if I don't have time to reapply. Haughty Mauve isn't really mauve at all, on me it's really more of a raspberry shade and quite similar to my beloved Revlon Cherries in the Snow that I wore a lot a few years ago. High five if you remember those days! This shade also applies smoothly, but sometimes it can look a little streaky with just one layer. Again it also wears nicely, there's always a bit of a stain left behind at the end of the day, which looks pretty. 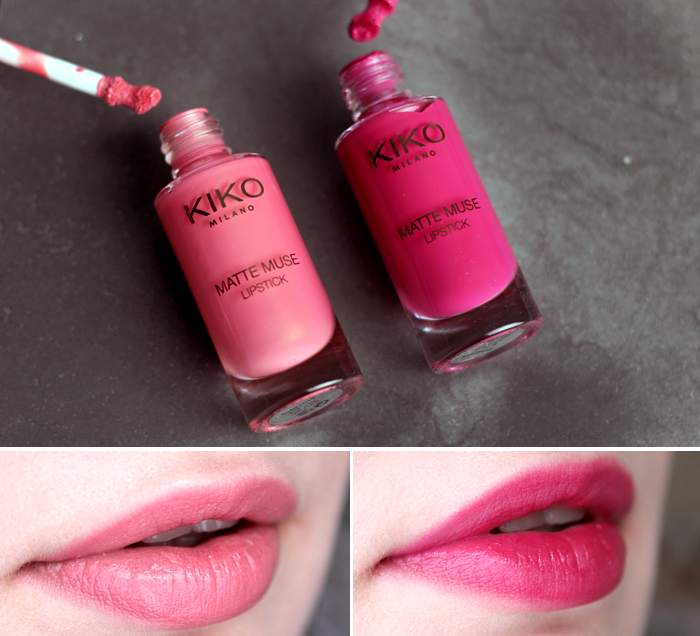 I'm certainly beginning to see why products from Kiko receive the praise they do. Is there anything from Kiko that you would particularly recommend? Ooh these look right up my street Jennie! Might have to treat myself! I love the look of plushy rose! I might have to look into getting that one myself. I've never heard of this particular lipstick but I have heard that Kiko is a great brand. Both shades look gorgeous! These look very pretty! I've never tried Kiko before but I'm sure my day is coming soon! Pinks really suit you! Both of these shades are stunning, and they look so creamy. I've read so many great reviews of Kiko's makeup range lately. I really must get down there. The packaging's so so cute and luxe also. Their nail polishes are excellent also! I think both shades are beautiful. Kiko is still a new brand to me. I have a couple of eyeshadows but there are so many products I would like to try. Its just quite hard to get hold of. They make your lips look really plush! These look like such pretty shades! <3 Every time I'm in Guildford I walk past the Kiko store and have to stop myself going in because I know that I will just spend a lot of money. So pretty!!!!!!! The bright raspberry looks perfect with a white sweater for Christmas!